A few years back, I was at a craft store looking at the yarn. I wanted to learn to knit but didn’t really have anyone around that could teach me. I got to talking with the sweetest little lady you ever did meet. She was from England and was a pro as she started knitting in kindergarten. We talked for a bit and she actually invited me to learn from her….at her house. Can you believe that? For a few month I went, and tried to learn, but some family issues came up so I had to step away from the learning process for awhile. I wish I lived in the area again so I could meet back up with this cute little lady. Anywho, during this time I started picking up some yarn at thrift stores with all sorts of aspirations. And like any good upcycler, I keep all the goods on hand…..just in case! 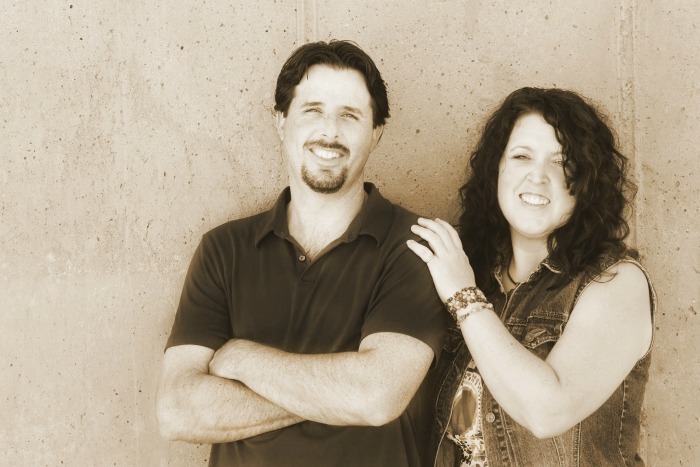 *We do use affiliate links to share the item, or similar, used in this project. If you were to make a purchase, we could receive a small amount to keep the content free here. You can read our full disclosure policy here. Wreath – Got at the Thrift Store as well. Ribbon – From my leftover stash! Hot Glue Gun – This is the cordless one I am using and when that one gives up I want to move to this one. Hot Glue Sticks – I prefer the longer ones as they don’t run out as fast. As stated above, choose the colors that best go with the theme you are creating. I picked out 6 colors. 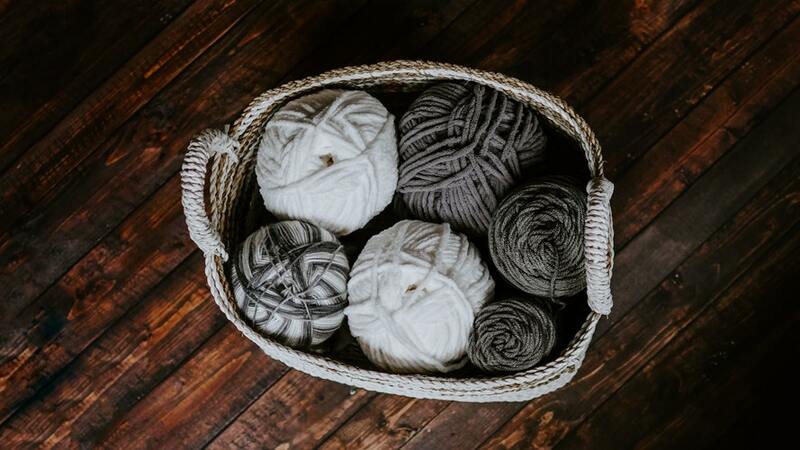 Create a ball of yarn by wrapping around two fingers to start- aprox 6 times. Remove from fingers and wrap the tail end around it to start a small ball. Wind the yard to the desired size. For this wreath, 3 yarn balls were made from each color (a small, medium, and one large). 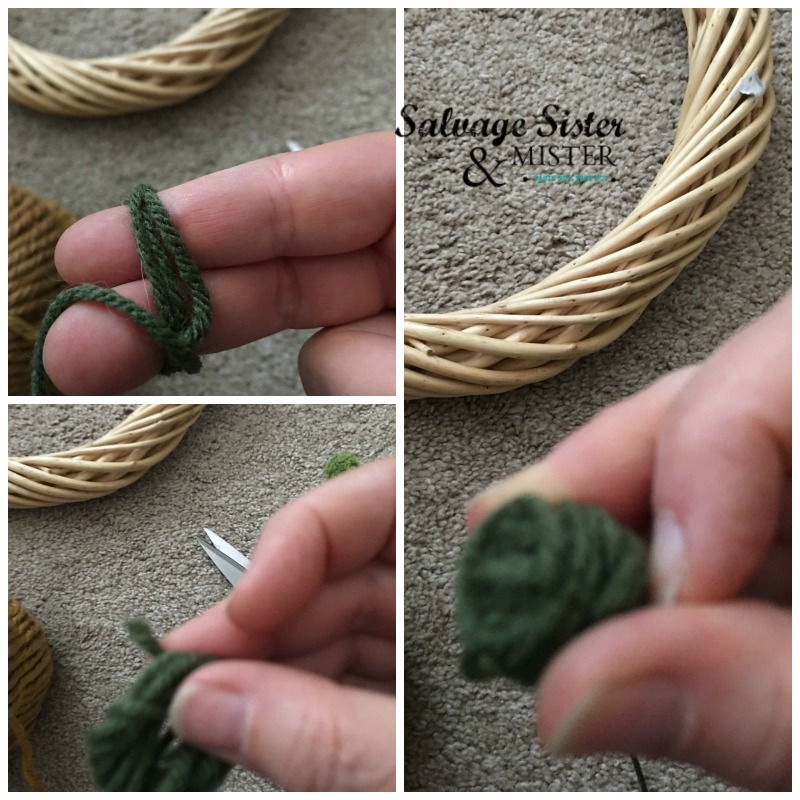 Once you are done winding the yarn, tuck the end yarn into the ball. You can hot glue it if you like. 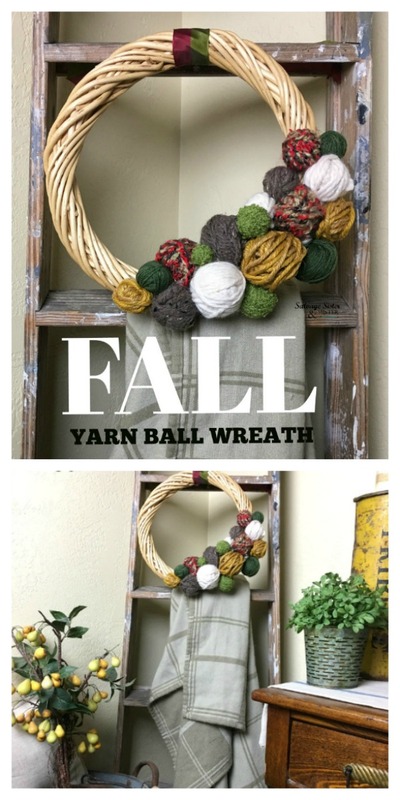 After you have completed all your yarn balls, you can either start gluing them to the wreath or you can do a practice design layout on a flat surface. Note- I did glue my tucked end piece down so it would be extra secure. 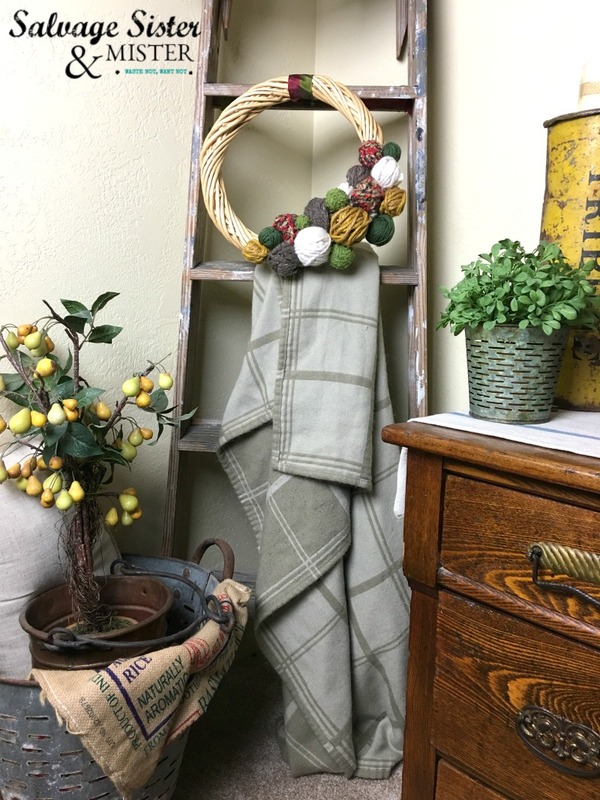 Use a ribbon to hang in your desired area. Looking for an Olive Bucket? You can find one here. This wreath took about 30 minutes, or less, to make and could easily be done while watching a favorite show. 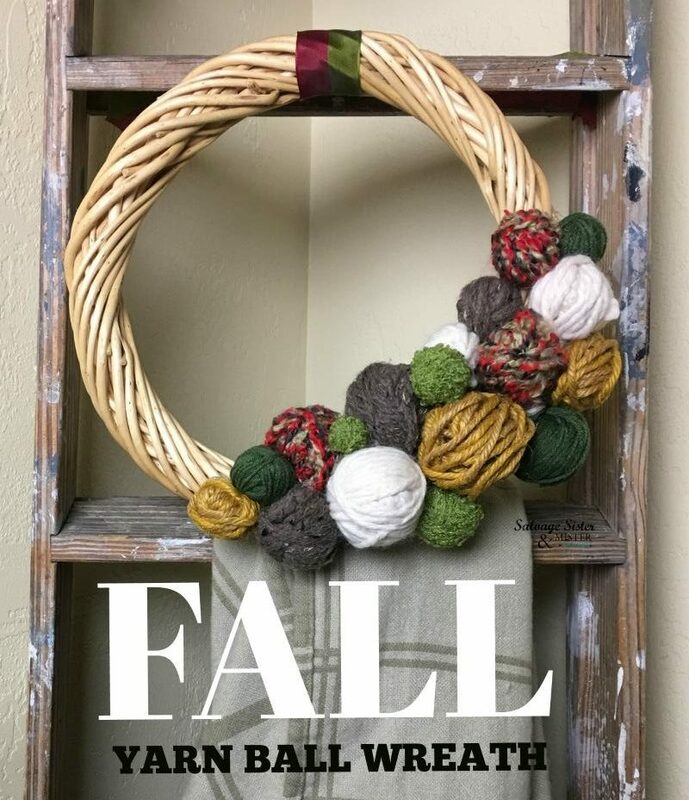 If you have extra yarn lying around, this little Thrifted DIY Fall Yarn Ball Wreath is fun to make for yourself or as a gift. Here is another project we think you will like – A FAUX SUCCULENT PISTACHIO WREATH!. And be sure to sign up for our newsletter if you want to ensure you don’t miss any projects we have to use up what you have. Your wreath is gorgeous, but I am love love loving the final vignette. What a wonderful display. I really love all the layers right down to how you folded the cloth. You are so kind. I esp love your projects and photos so it’s a great compliment. This is such a neat idea to use up all of your scrap bits of yarn!! Might have to make this in Christmas colours! Thank you Sam! I love how it turned out. 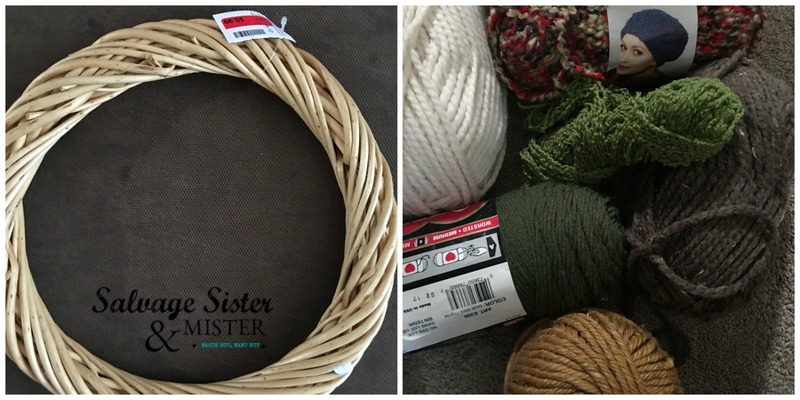 Great idea I would never thought to make a wreath with yarn. Turned our really pretty. What a great idea, and so pretty! Perfect colors for a fall wreath. I have lots of leftover balls of yarn. Thank you Linda. It was fun to make. Thank you girl. You are always such an encourager. Truly a gift, along with your amazing DIY abilities!